Lucille Bauer, left, and Lyn Pezold, of NYS Federated Garden Clubs with Salva in NYC. Water for South Sudan is so grateful to our many supporters, across the US, and around the world, who enable our life-saving work in South Sudan. We are especially thankful to those groups who commit to helping us year after year, and find a special connection to us through their work. Once special group of super supporters is our friends in the Federated Garden Clubs of New York State (FGCNYS). The Garden Clubs have raised over $144,000 for WFSS since 2010. They have sponsored seven new wells, and this year they also sponsored the rehabilitation of an older well. Salva and WFSS Executive Director Lynn Malooly were able to meet some of our Garden Club members in New York City in March while Salva was in town for World Water Day events. Lucille Bauer, State Chair for World Gardening, FGCNYS First Vice President was thrilled to meet Salva, and brought along Lyn Pezold, state recording secretary, District Director Graceann Morawek and fellow Castle Manor member Karen Maskuli. "We're proud to sponsor Water for South Sudan as our World Gardening Project," said Lucille. "It was a pleasure to to meet Salva in New York. We are thrilled that we collected over $25,000 in 2016 for WFSS." The Garden Clubs have consistently raised over $15,000 a year since 2010, and have been sponsoring wells since 2011. "We are so grateful to our gardening club friends for choosing Water for South Sudan for their World Gardening Project," said WFSS Executive Director Lynn Malooly. "Their support, for so many years, has transformed thousands of lives in South Sudan." FGCNYS's first well sponsorship came in 2011. This past year they had their highest fundraising totals ever, and donated to WFSS. These funds will sponsor another new well next drilling season. In addition, they were able to sponsor the rehabilitation of an older well this season. This new pilot project, spurred by our 2015 well evaluation study, led to the creation of our well rehab team in 2017. To date this year the new rehab team has repaired the cement platforms of 26 of our oldest wells. "Thanks to the support of FGCNYS, this repaired well will continue to produce clean water for years to come," said Malooly. The Federated Garden Clubs of New York is a member of National Garden Clubs, Inc., the largest gardening organization in the world. The Federated Garden Clubs of New York State, Inc., was founded in 1924 and incorporated in 1930 for the purpose of supporting the Garden Clubs of New York State. The FGCNYS presently includes more than 250 garden clubs with 8105 members across the state. WFSS Drills 300th Well in South Sudan! Water for South Sudan reached a significant milestone last week with the drilling of our 300th well. Starting with our first well, drilled in Founder Salva Dut's village in 2005, we have not stopped in our mission to bring access to clean water in South Sudan. Despite continuing challenges in South Sudan, our work continues, and we continue to transform lives. Water for South Sudan's 2017 season is winding down as the end of the dry season approaches in May. Once the rainy season starts in earnest our vehicles are not able to travel through the muddy "roads" of South Sudan. Until the rains come, however, our drilling, rehab and hygiene teams will continue to reach remote, rural villages in need of clean water and hygiene education. well sponsored by employees of hmh, publishers of a long walk to water. 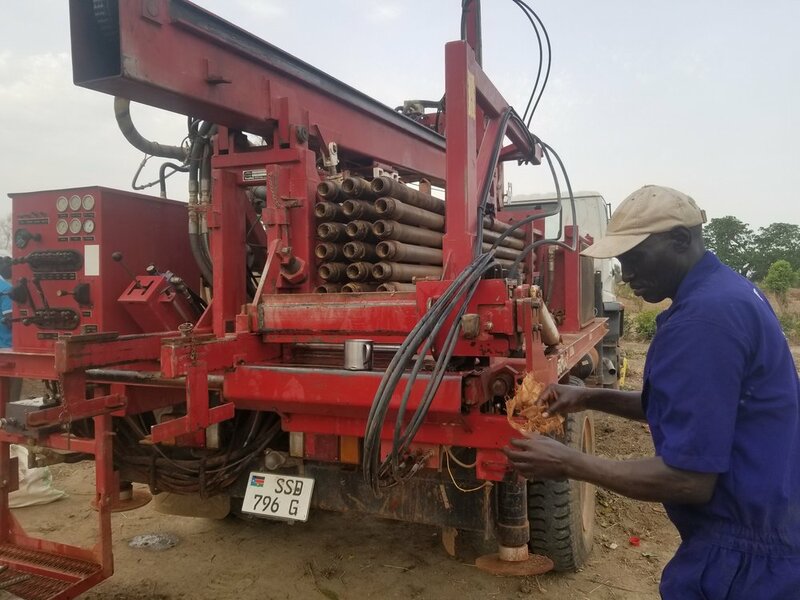 Our drilling team, led by "A.J" Agok, our Assistant Country Director, has drilled 19 new wells this season, bringing our total to over 300 wells drilled since 2005. Each new well brings greater health and stability to a village. Access to clean water means that girls and women no longer have to walk miles to gather water that is often dirty and contaminated. A well in a village can be the first step toward stability and development. Markets, schools and clinics can grow up in a village that has access to water. Our pilot well rehabilitation team, led by WFSS Country Director Ater Thiep, has had a very successful year, going over their original goal of rehabilitating 20 of our oldest wells, and has repaired 26 wells as of April 24, 2017. The creation of the rehab team grew out of our 2015 well evaluation trip in which we were able to visit 80 of our wells. While we found that all wells were operational and producing fresh water, we also found that the cement platforms on some of the oldest wells were worn and eroded. This prompted a look at our procedures, and led to an improvement on many aspects. Our rehab team reports that villagers are very pleased with the results. an older well, before wfss rehab's work. see below for repaired well! Both the drilling team and rehab team are using a new design this year, which includes better cement mixing for the cement platforms and animal drinking troughs. Our US Operations Team designed a long narrow drinking trough, leading away from the well head, for animals to drink. This allows villagers to get water for their animals without adding more wear and tear on the cement, and also keeps the animals away from the well head. Other NGOs in South Sudan have been interested in our new design and have given us positive feedback on its efficiency. In addition to drilling and rehab, we now have two hygiene education teams, one each traveling with the drilling and rehab teams, helping to improve hygiene practices in every village we visit. WFSS strives to involve community members, and give local ownership in everything we do. Wells are installed after consulting with county officials, and village elders determine final placement of the wells. Hygiene education addresses the specific needs of a village, training four men and four women in each village. These villagers can then train others, helping to share education which improve health, hygiene, and the impact of clean water. The 2017 season will be coming to a close soon. Once this season ends we will debrief with our team and begin plans for the next season. South Sudan faces many challenges, but our teams are safe and able to do their work. We are in continual contact with them and are always assessing the safety and security both in the country, and in the areas in which we work. Our team assures us that our work can continue. Water for South Sudan thanks all of our supporters, across the US and around the world, who enable our work. the third well of the season was sponsored by lewis m. myers elementary school in bellwood, pa. The 2017 drilling season continues as WFSS helps bring access to fresh water and hygiene education in South Sudan. The drilling team, led by Ajang "AJ" Agok, has now drilled eight wells. This year they are focusing on providing water for schools, with plans to drill up to 40 new wells. Our rehab team, led by Ater "Lion" Thiep, has already repaired ten of our oldest wells. This pilot project was driven by our 2015 evaluation of wells which showed that older cement platforms were in need of repair. We have strengthened our cement mixing process and improved the design of the platform, and the channel that leads from the well head to the drinking pool for animals. They plan to repair up to 20 of our older wells, and then may be able to join the drilling team to help them reach their targeted number of wells. Traveling alongside each of these teams is a hygiene education team which helps villagers improve hygiene practices. The WFSS teams train eight trainers (four men and four women) in each village who then can train others. The educators teach about how germs spread, how to keep water containers clean, and also help to identify hygiene behaviors in need of improvement, all of which help to expand the impact of clean water. The 2017 got off to a later start than usual, but crews are working hard to make our goals for the season. The WFSS teams continue to monitor the situation in South Sudan, and are in constant contact with our board and staff in Rochester, New York. The team has assured us of their safety, and report that they are able to conduct operations without impediment. WFSS team members in South Sudan are in contact with local NGOs in Wau, home of our operations center, and continue to explore ways in which we can work with other NGOs in the area. We will continue discussions and possibilities to be of help in refugee camps for IDPs (internally displaced persons) in the area. The entire WFSS organization is committed to the future of South Sudan, and supports all efforts to resolve conflict and bring peace to this young country.